What’s it like to be teenager in Haiti? If your parents have the means, you will go to a private school in Petionville, a hilltop neighborhood of Port-au-Prince where some of the best restaurants are found. Someone will drive you to school. Your uniform will be washed with laundry detergent regularly and, each day before school, it will be ironed. It’s not. 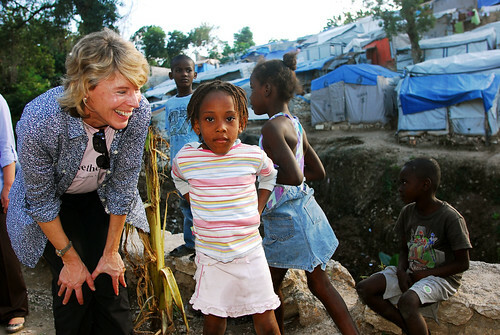 In Haiti, this life is a pipe dream for most kids. Go to the Gaston Margron camp in the Carrefour neighborhood, and you’ll find a family of teens, managing on their own. Marclene, a shy 20 year old, acts as the mom for her three younger siblings. She shares a hot tent with her sister, Darline, who recently had a baby, Marckensley (she named him after the Gospel of Mark in the Bible). The two sleep on a twin mattress with Marckensley between them. Their younger sister, Mouna, sleeps on a mat on the floor. Their clothes are slung over a cord that runs across the tent. When I visited them, they had no money for laundry detergent, so they were rinsing their clothes in a big tub of water. It’s the same tub they bathe in; they don’t have money for body soap either, so they just rinse the sweat off. Their biggest concerns are elemental: food, water, and sleeping. They rely on their brother, Ted, who sells plastic bags of water in the market. But they cost only a few pennies a piece. Ted has to sell hundreds to make a few dollars. He says he makes about a dollar a day. This is the money the five of them live on. Life is tough. But Marclene tries not to let it get her down. She’s prays a lot—her Creole Bible is worn at the edges—and she tries to stay positive. Like young people everywhere, she scraped together enough money for a cell phone, but finding the money to pay to charge it is hard. A lot of kids live like Marclene and her family. It’s not a pleasant life, but they’re getting by. One thing they don’t have to worry about: health care. Save the Children provides if for free in their tent camp. Our clinics in Haiti average 4,500 visits a month. And it’s all free. A lot of people shake their head when they think of Haiti. But they shouldn’t. Haiti is still in better shape than a lot of countries. Think about it: It is next door to the U.S.; more than 1 million Haitian live in the U.S. and send remittances back to Haiti; foreign government pledged billions to Haiti and the first signs of private investment are slowly starting – a Marriott Hotel is slated to be built outside Port-au-Prince. While the news out of Haiti is often grim, don’t give up on the country. Haitians certainly haven’t. And that should be a lesson to us all. Learn more about our ongoing work to ensure a better future for Haitian children. 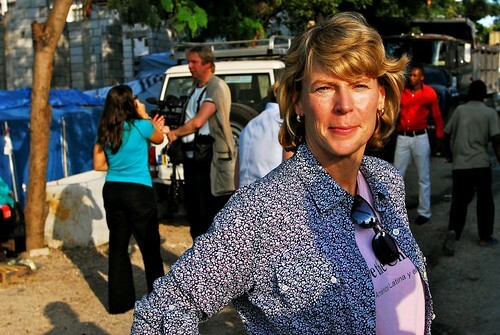 I worked in Haiti in 2004, when I responded to two natural disasters and civil unrest in Cap-Haïtien. Six years later not much has changed. On top of the earthquake, Haiti has faced four emergencies in the last 10 months: hurricane season (Tomas flooded many of the flimsy tents around Port-au-Prince), then came the cholera epidemic and finally the pre- and then post-election violence. How can any country have the opportunity to bounce back let alone recover in such circumstances? I was in Juba, Southern Sudan when I heard that an earthquake had struck Haiti. I could not believe my ears! Haiti has always held a very special place in my heart, maybe because I met my fiancé in Cap-Haïtien and because all the wonderful moments we experienced with all our Haitian friends dancing kompa and talking about why they would never leave Haiti. I work as part of the Food Security and Livelihoods team with Save the Children. We are 16 in total, 15 national staff and me. Sadly I am the only woman in the team, but we are trying to rectify this! After the January 12, 2010 earthquake, a large proportion of Port-au-Prince residents lost all their belongings. Women, both as family providers and as small-market traders, have borne the brunt of this loss and income. One disastrous consequence is that without a reliable income families are no longer able to pay the school fees to keep their children in school. In Haiti it is the women who generate the majority of the household income. Livelihoods underpin sustainable development. Save the Children’s goal is therefore to improve and diversify livelihood activities to enable families to provide appropriate care for their children, send them to school and ensure that they are healthy and well nourished. As we transition from the emergency phase to longer term development, our Livelihoods programme aims to support Haitian households to do this. My work is to increase and improve people’s access to employment opportunities, with a particular focus on the market traders who sell their wares in the Croix des Bosalle market – the major market in Port-au-Prince. We also want to help small businesses such as carpenters and blacksmiths with grants to rebuild their industries. But in order to receive these grants, the entrepreneurs are required to take part in Business Development Services (BDS) training. By linking small-scale market traders to business development and microfinance services, we support traders to develop business plans and increase their knowledge of management capacities and knowledge and access to micro-credit and savings plans. Our programmes also supply small grants with which people can recover the tools and household assets they lost during the earthquake – with the money a plumber can buy a wrench; a carpenter hammers and nails and a mother can buy pots and pans to cook for her children. 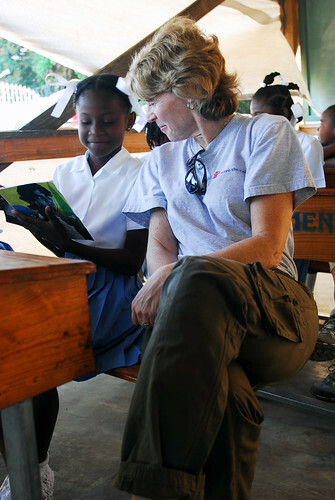 2010 was a busy year for Save the Children in Haiti. From the onset of the disaster our Voices from the Field blog kept readers informed about on-the-ground efforts in Haiti. We've created four Flickr slideshows that recap the progress we have made in providing relief to Haitians and look ahead at the work remaining to build back Haiti better. One of the early glimmers of hope was the rescuing of a baby named Winnie. She was pulled from the rubble by an Australian television crew and quickly treated for dehydration by Save the Children medical staff. In May and October our staff caught up with Winnie who is now a healthy and lively 2 1/2-year-old. Check out the album below to see the newest photos of this "Miracle Baby". Cash for work, cash grants and asset recovery vouchers are among the programs that Save the Children supports, specifically targeting the most vulnerable families as identified by their own communities. The most vulnerable include female-headed households and families with one or members who are more chronically ill or living with disabilities. Some cash-for-work projects also reduce future disaster risks - for example, stabilizing river embankments in Jacmel and protecting families' assets from flooding by cleaning canals in Léogâne. Through our support for farmers, fishermen and other small traders, Save the Children is contributing to economic recovery in Port-au-Prince, Léogâne and Jacmel. These programs will ensure that families can provide food for their children, rebuild their homes and send their children to school. Education is key to building a better future for Haiti’s children, and it remains one of Save the Children's top priorities. We have provided tents, furniture and supplies so schools could reopen as quickly as possible, allowing children to learn in safe surroundings and regain a sense of normalcy. In addition, Save the Children has trained 2,300 teachers in disaster risk reduction so they're prepared in the event of another earthquake and we have distributed school kits which include a backpack, notebooks, pencils and other essential supplies to more than 38,500 children. 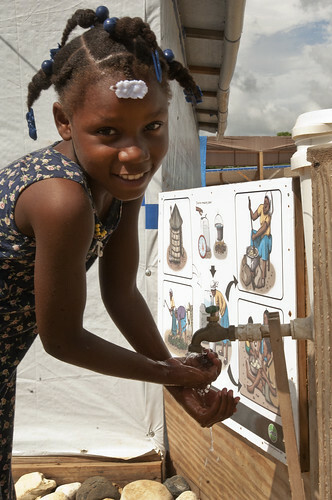 Cholera first struck Haiti in October 2010 for the first time in decades. The global support Save the Children received, allowed us to respond quickly to the outbreak, which had not been seen in Haiti for decades. As cholera continues its deadly spread, Save the Children is intensifying efforts to prevent and treat additional cases in the areas where our health and hygiene teams already have a presence and have relationships with communities. Our health workers — reinforcing an intensive education campaign spearheaded by the government of Haiti and other international organizations — are broadening prevention and education activities to provide families with information about the importance of washing hands with soap, boiling water and seeking medical support at the first sign of illness.We aim to reach 600,000 people in six months with these activities. On this one-year anniversary, of the earthquake, Save the Children and others have made a meaningful difference in the lives of millions of Haitians who have lost so much. But it is clear that the needs remain great and vast amounts of work lie ahead. The country’s children are both the most vulnerable, and the most resilient of its citizens. Investing in them offers the best chance for a better future for the nation as a whole. The global community must seize the opportunity to support a new Haitian government in creating meaningful change in the lives of some of the world’s most vulnerable children. Save the Children is committed to Haiti for the long-term, and the promises that the international community has made to Haiti and its children must be kept. I've been working in Haiti since April and I've seen quite a bit of progress, especially over the past few months. As most people know at least 230,000 people died in the earthquake in a country that was tremendously poor even before the disaster. Indeed before the quake only about a third of Haiti's population had access to safe drinking water, and half of Haiti’s children weren't in school. Save the Children immediately responded to the earthquake. 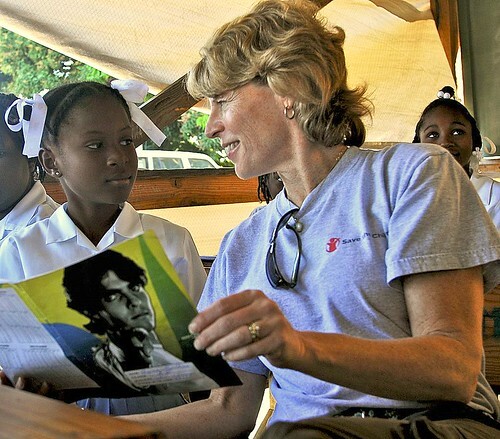 Because we've had a presence in Haiti for over thirty years we were able to mobilize staff both here and from around the world to mount one of the largest humanitarian responses in the agency’s 91-year history. Until recently there were 1.3 million people, about sixteen per cent of Haitians, living in tents. When I say tents we're really speaking of plastic sheets and poles. These are not tents that people would take camping anywhere in the world. These are tents that are more like kite plastic held up by a few wooden poles. To believe it you really have to see the situation in which people are living. It is a standard below what I would say is sub-human. Beyond that another 500,000 people relocated to live with family and friends in rural areas. They're part of the hidden earthquake-affected population that are not visible. They place a huge burden on their families in the rural areas who already had a hard time feeding themselves before the earthquake. Now these families have permanent houseguests who didn't just come for a meal or a visit, but for the unforeseeable future. 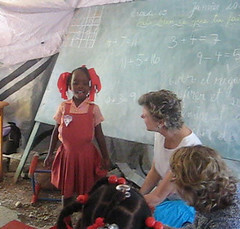 But when our team and I talk to Haitians, education is always the highest priority. It's where they want to invest in their children's future. It's critical to them that these private schools open as soon as possible. That’s why in 2011 Save the Children will partner with 154 schools through teacher training and resource materials, enabling 45,000 children to get an education. But these are just the reported cases. Many people living in rural areas don't have access to cholera treatment centres, where literally within one to three days a person who has cholera can walk out healthy. However, in a country where only half the people have completed fifth grade, it's a challenge to get our message out about safe sanitation practices. One year since the earthquake we understand why some people would be disappointed with the slow pace of recovery in Haiti, and why things are not better. All of us working here would very much like to accomplish more. But it's important to remember that things were bad in Haiti – the Western Hemisphere’s poorest nation – long before the quake. That said the process has been slow. All of us would admit to that – all of us who work cooperatively within Haiti’s NGO community. Indeed after I finish writing this blog I will attend the weekly meeting of NGOs where we share what's working, what's not working, and what type of support we need. We ask ourselves what we can do collectively to improve the situation. We started out early today to head to Leogane - the same drive I made 10 months ago on my first visit after the earthquake. With a beautiful morning dawning we started out and I have to say, I was hopeful as we passed into the epicenter area, the hardest hit by the quake. There were significant signs that progress was being made. All along the coast of the southern finger of land out from Port-au-Prince, rubble removal was evident and most importantly, the regular "busyness" of Haiti had returned. Little stalls selling clothes, mangoes, shoes, and all manner of car accessories - sometimes all from the same little wooden shop - had re-established root on the sidewalk or the edge of the road. Motorbikes and cars clogged the busy road and people were on the way to jobs, and kids to the first "official" day back to school, spiffed up in clean uniforms and shoes. The camps and tents along the way were larger though, with more people and looked more established than I remembered. Clearly there were still many people who had not moved back to their homes or towns. As we drove into Leogane city, I was again struck by the number of people out on the streets and the contrast with those much quieter times after the earthquake. People then were still living in fear of the aftershocks and many were in full mourning for the ones they had lost - mothers, fathers, sons, daughters and so many others. We reached the Save the Children office in the middle of town and hundreds of people were there - volunteers and staff all with particular assignments to go work in the camps, on water and sanitation projects, or with local schools. We quickly said hello to Samuel, the head of Leogane office and headed out to the programs. As we drove down the road, several large trucks full of rubble rumbled by - it seemed here in Leogane the clearing process was still needed but a lot of progress had been made. We saw backhoes and frontloaders - both non-existent in the country after the quake - moving tons of rubble. They say only about 10 percent of the rubble has been cleared in Port-au-Prince still but Leogane clearly had made much more progress. We first visited the recently completed school constructed by Save the Children just down the road from the center of town. While today was the first day of school officially, many of the kids typically don't show up till later in the week. Still, there were about 60 children there, dressed in crisp white shirts and blue skirts or shorts, the girls' hair with white ribbons, beads and bows. Many of these children were living in tents or simple plywood houses after the earthquake and we marveled over how much effort must have gone in to preparing them for school. The school itself was very uniquely constructed to withstand earthquakes and hurricanes, with open vents along the top and sides and wood construction meant to "give" with flaps of plastic sheeting that could be rolled up and down depending on the temperature and winds. The headmistress of the school spoke with us and seemed very happy with the way the school and her pupils were starting the new year. In a class of what looked like 4th graders, the lesson was on fractions, with a little girl next to me afraid to raise her hand. I urged her on, but she confided she had not remembered to study fractions over the holiday break with a shy smile - kids are the same everywhere. I thought about my own 3rd grade daughter who also didn't do much studying over break!. We headed next to the Save the Children health clinic and baby tent. 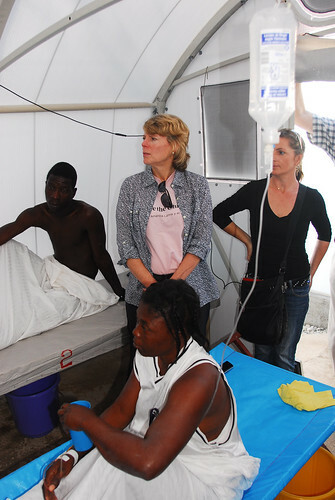 The clinic is made up of two open air shelters and 3 small medical services structures. In one, a midwife examined pregnant moms, gave advice on family planning, and examined toddlers. In another, a full pharmacy was operating with medicines available free to the local residents. In the third building, several nurses weighed and measured babies, helped mothers breastfeed and gave out supplemental food to malnourished children. The malnutrition rate in Haiti was over 60 percent before the earthquake and it continues to be a major problem. Mothers could take home supplies of Plumpy'nut, a peanut-based meal in a pouch which significantly reduces malnutrition in young children, from the health clinic. The clinic was impressive, with over 50 patients being served when we arrived. Our worry was about on-going funding though, as much of the earthquake funding would soon be used. In fact the ability to keep many of the programs going without increased funding is a constant worry for our staff in Haiti. Though we raised over $88M for the response, clearly there were many programs that were going to have to continue. Our original 5 year plan called for a budget of $175M and we are far short of that goal now. But as we headed off from the health clinic, I knew we had to continue these programs somehow and hoped that the anniversary of the earthquake might remind people of the needs in Haiti again. Ive been told I have the dream job. I manage the social media for a cool organization that does amazing things to help children all over the world, including the US. Well, this month was no exception to living an exciting life while doing good. I was invited to attend and do "live" social updates at a star-studded Bingo Night Haiti benefit in Hollywood right on the famous CBS studio lot. As the guests arrived, they soon drifted over to the "silent" auction tables to see what interesting items were donated and up for auction. Auction items included guitars from Melissa Etheridge and Maroon 5, fabulous destination rentals and beauty treatments, among other fun things. I introduced myself to many of the celebrity guests and asked if I could take their photos and share them with Save the Children's followers on Twitter and Facebook. They were delighted to help and graciously stood steady while I snapped a photo with my iPhone. They hoped that by sharing the evening with our followers (and their friends) that it could help bring awareness to the needs of the children in Haiti and would encourage others to help, as well. 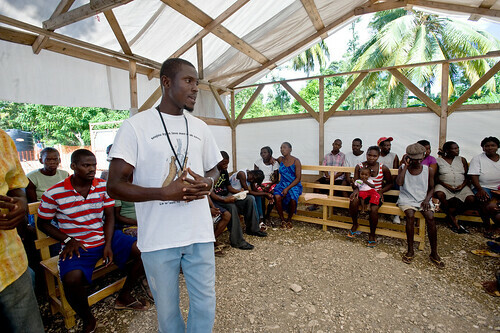 In its new blog Inveneo details how the company is helping Haiti build back better. A newly announced partnership with the ETKA Foundation and Microsoft will "accelerate the deployment of a high-speed, broadband wireless network in rural population centers and technology for schools throughout Haiti." This isn't the first time Inveneo has used its technical capacity to aid Haiti. The disastrous earthquake on January 12 decimated the capital, Port-au-Prince, its environs and much of Haiti's infrastructure. Communication became near impossible. "The need for information far exceeded our capacity," Gary Shaye, Haiti country director of Save the Children, said. "Our ability to respond to the earthquake increased dramatically," Shaye said. "It’s really important for NGOs to divide their responsibilities and get as great of coverage as possible." With our communication lines restored, our staff could ensure that relief efforts reached as many areas as possible, eliminating duplication of efforts and ensuring that we reached children and families in most need of assistance.